DC post coming soon…but first, it’s snack time! I’m behind on a lot of things; this is no exception. I’m plugging through a post about the trip to DC bit by bit, but first, I wanted to quickly review a snack I found by accident. Love me. Love me like I love you. Most of the time, I avoid chips and crackers. I’m not being sanctimonious, conscientious, or anything noble. I just usually don’t like them. Then when I do, I want to eat the whole entire bag. Take sweet potato and root chips. I love them, and I have no self-control with them. Therefore, I buy them only once in a while. This same truth applies to the delicacy that is the black and yellow bag to your left. 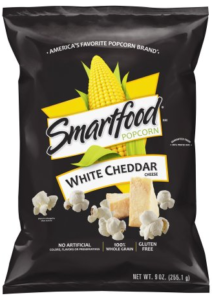 The whole “not liking chips and crackers” thing is only mildly inconvenient because there are so many other snack options, but sometimes you just want a crunchy, salty thing instead of a carrot (which I realize as I type this sounds dumb because they, too, are crunchy). Alas, I keep trying. I’m usually very underwhelmed. Potato chips? Bland. Kettle chips? A bit less bland but still just potato chips. Pita chips? Eh. Chex Mix? They’re just pretzels with a few cool friends. Bagel chips? Only if they’re everything bagel chips and I can eat the whole bag. I’ve made my own snack mixes and chips, too. I simply have no time to keep up with that habit. 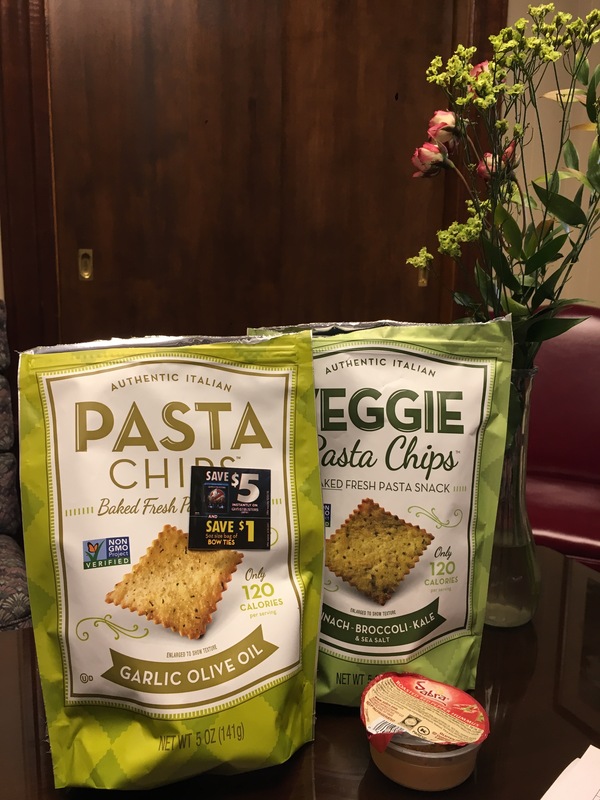 The other day at Publix (you knew that’s where I’d be by now), I spotted something called pasta chips and went through a quick series of emotions followed by a quicker series of actions. First, I reviled them. Then curiosity took over. Then hunger. At the same time. Next, I noticed they were BOGO. Suddenly, they sounded like a good idea. Finally, I bought them. I didn’t even look at the flavors; I just grabbed two by color. I assumed the red bag was spicy, but I later found out they’re marinara. Green and other green seemed safe in that split second. Well, damn it if these things aren’t kind of awesome. Yes, both bags are open, and I feel zero shame. They smell exactly like feet and garbage. Both varieties. The garlic and olive oil are more foot, and the spinach/broccoli/kale ones are definitely garbage. Don’t worry. It’s weirdly not a prohibitive toe/trash smell. It was more like the smell came after I was finished. My office smelled bad, and I knew it wasn’t me so I opened the bags again and discovered the source of the offending odor. They are better with hummus. What isn’t, though? You’re right. Chocolate. They’re kind of odd by themselves, to be honest, because they’re a bit dry. The hummus gives them a push. 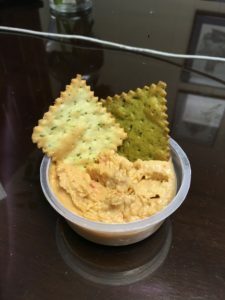 I had Sabra roasted red pepper (I’ve moved on from their latest listeria crisis), which was a good flavor balance for the greens and the olive oil/garlic flavors. Who’s going to eat only five of these at a time? Come on. Look at them next to this 2 oz. hummus bowl! Can you guess which one is the veggie? filling just like pasta is, but you’ll feel compelled to finish the little hummus bowl if you go that route, and it takes more than five. Every flavor you try will be your favorite. Really. I tried the olive oil and garlic first and thought, “there’s no way the others are this good.” Then I tried them, and they were better. I went back to the olive oil ones and decided they were the better of the two. Back to the veggie and they were the winners again. They’re just good, okay? They’re non-GMO and vegan. They are not, however, gluten free. I mean, let’s be real. They’re pasta chips, and while I respect the attempts at creating gluten free pasta, there is no true substitute for the real thing. You can find these guys at your local Publix if you are so lucky. If not, you can use their Find A Store feature and track some down. Posted in snacks, Veggies•Tagged chips, crackers, non-GMO, pasta, picky, Publix, snacks, vegan•Leave a Comment on DC post coming soon…but first, it’s snack time!